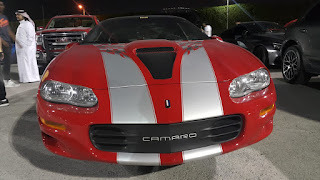 I have been at the center of almost every car meet here in Qatar. Be it Drag race to drift, street car meets to roll race or some dirt throwing sand dune climbing. What amazes me the most is the discovery that i have not yet tapped into what this great country can give in terms of its street roaming muscle cars. Usually i spot most of these cars either going hard at the drag or drift circuit in the industrial area. I have widely read the Chevy history how in between the 1993-2002 For Camaro’s 30th anniversary, Chevrolet designers penned a white 1997 Z28 with orange stripes and hounds-tooth upholstery, similar to the 1969 Camaro Pace Car. 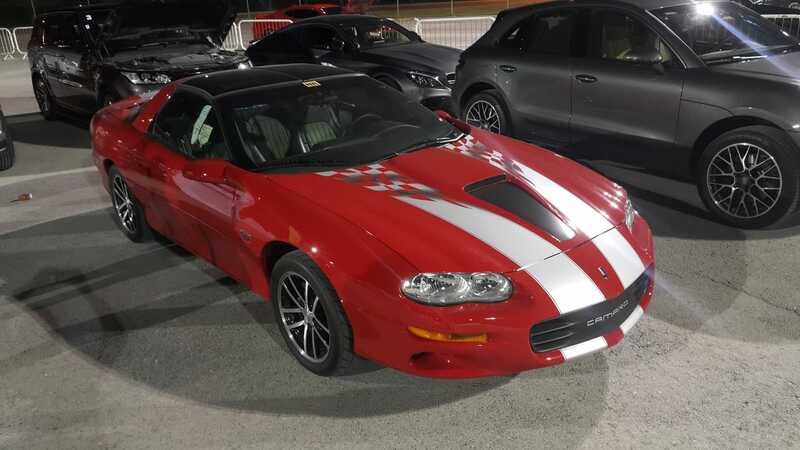 For 1998 Camaro received a new front fascia, and the all-aluminum small-block LS1 V8 from the Corvette was dropped into the Z28 — rated at 305 horsepower and 335 lb-ft of torque. The Camaro SS added ram-air induction to increase the LS1 output to 320 horsepower. A 35th anniversary graphics package was offered for the 2002 Camaro Z28 SS coupe and convertible. Camaro production ended after the 2002 model year and lay dormant for eight years. 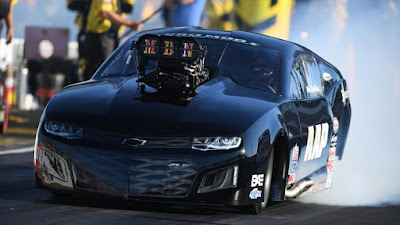 Not in my wildest of dreams had i ever imagined meddling with any these Annivesary Chevrolet SS untill one showed up at an open drag race in Qatar. Usually my duty entails around the happenings of Qatar Racing,and spotting that mean sprouting nose of a convertible 2002 limited edition Chevrolet Camaro SS 35th Anniversary was a mind gobbling experience. Bright Rally Red, Ebony leather seats, 325hp 5.7L LS1 V8, automatic transmission, removable glass T-Top roof panels, rear window defroster, 35th Anniversary striping, badges and seat embroidery, cruise control, remote trunk hatch release, fog lamps, power windows, locks and mirrors, leather wrapped steering wheel with redundant audio controls, theft deterrent alarm, 6-way power driver seat, 500 watt Monsoon audio system with CD, WU8 SS performance appearance package, forced air induction hood, 17″ aluminum wheels, SS rear spoiler, high performance ride and handling suspension, low restriction dual exhaust.